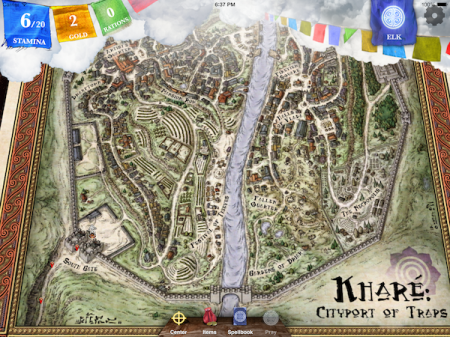 inkle blog - The Gates of Kharé have opened! 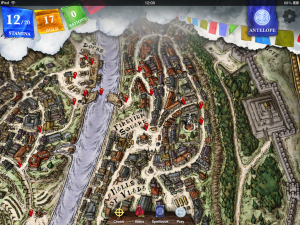 If you played Sorcery! Part 1, you'll know what to expect, but the new game is much bigger, more intricate, with puzzles and mysteries to solve. In this game, it's not enough to simply make it across the city: surviving Kharé is only the beginning. It's hard to measure the size of a massively-branching game, but by a straight word-count, while Sorcery! 1 had 150,000 words including combat, Sorcery! 2 has 340,000 excluding fight-scenes... and there are almost twice as many of those. There's also more of the world, as not only does the detailed map show every building in the Cityport, there are several you can go inside as well, with the camera swooping down through the hand-drawn ceiling. If you didn't play the first game, you can jump straight into the Part 2 - because the game knows if you're a returning player or a newbie, it'll adapt to suit your needs. So if you're starting fresh you'll get all the tutorials and introductions that you need (and if you're returning we promise not to try and kill until you at least make it inside the Gate). We think this might be the closest thing to an open world text-based experience that has ever been constructed. And there's no repeating content, anywhere - every character, every encounter, every shop, trap, puzzle and joke is unique. The other big new addition to the second game is dice - yup, that's right, after taking dice out of the first book, we've gone and put them back in again, in the form of Swindlestones, a game of deceit, bluffing and betting. But just a betting game wasn't quite enough: like everything else in the game, we wanted it to tie directly into the narrative. So as you play against the inhabitants of Kharé, you also talk to them, with the intensity of what you say matching the intensity of your bids. You might learn vital information - but will risk that higher bid to get it..? To help you along with solving the mysteries of Kharé, we've added a new section to the Inventory - Clues. This keeps track of what you know, with each fact you learn recorded, and fleshed out as you gather more detail. It reflects the type of game that Part 2; almost a detective story. As you enter the Cityport, you'll find it in disarray, the Council disbanded and the ruling First Noble gone missing, and only by discovering what happened will you leave the City unscathed. 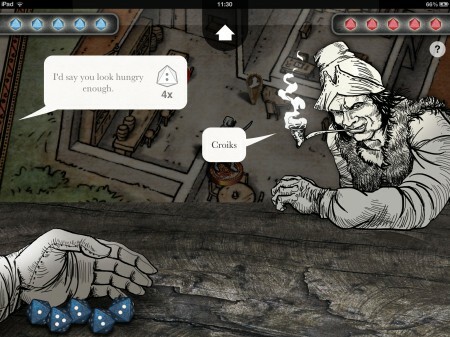 Uncovering the mysteries means solving puzzles: the gameplay in Kharé tries to capture some of the magic of old-school text-adventures and point'n'click adventure games, but in a smooth way, with all the satisfaction of solving, but with no getting stuck and no searching around for pixels or the right words to use. ...Let us know what you think! In short - Sorcery! 2 is bigger, better, meaner, and packed with secrets and surprises. We think it's the best game we've done so far. If you choose to step through the Gates of Kharé, then we'd love to hear what you think.